Traditionally, in a riddle game you have to solve the riddles in a fixed order. I call this type "serially-arranged type." 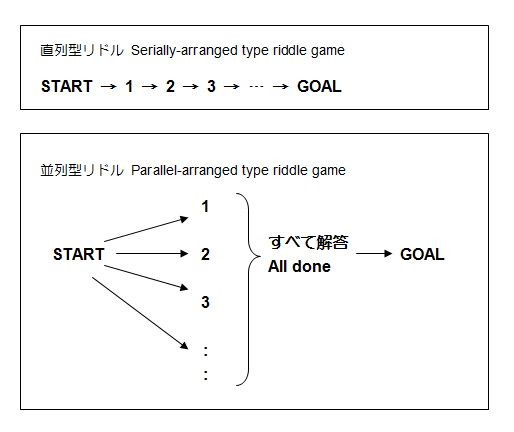 And today, what I call "parallel-arranged type" of riddle games is now becoming popular in Japan. In this type of riddle game, you can solve riddles in whatever order you like. "Nao's sticky riddles" series was originally made as serially-arranged type riddle games, and now they're being remade as parallel-arranged type.